CAPE CANAVERAL — Two million pounds of firepower successfully launched a behemoth Delta 4-Heavy rocket and a top-secret eavesdropping surveillance satellite into space today, embarking on a taxing climb directly into geosynchronous orbit 22,300 miles above the Earth to deploy one of the pinnacles of U.S. intelligence-gathering. Igniting its three hydrogen-fueled main engines in staggered sequence, the 235-foot-tall booster sent tremors across the Cape Canaveral region as it lifted off at 1:51 p.m. EDT (1751 GMT) to cap a smooth-as-silk countdown. The United Launch Alliance rocket headed east, a definitive clue the clandestine cargo was an equator-hugging spacecraft almost certainly a communications interceptor for the U.S. government to spy on terrorist groups and advisarial countries. The payload is owned and operated by the National Reconnaissance Office, the government agency responsible for running the country’s fleet of spy satellites. NRO spacecraft capture signals and images critical to the U.S. intelligence community for warfighters and policy makers combating ISIS and Al-Qaeda and monitoring the activities in North Korea, Iran, Russia, China and other global hotspots. “I believe the payload is the seventh in the series of what we call Mentor spacecraft, a.k.a. 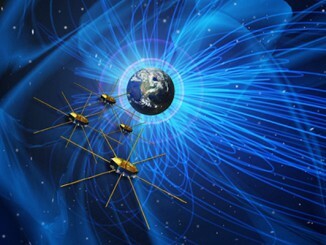 Advanced Orion, which gather signals intelligence from inclined geosynchronous orbits. They are among the largest satellites ever deployed,” said Ted Molczan, a respected sky-watcher who keeps tabs on orbiting spacecraft. This launch was known as NROL-37. The trek to orbit began at T-minus 7 seconds with ignition of the starboard booster, then two seconds later by the core and port boosters, a measure to reduce the free hydrogen fireball that has been a trademark of this launcher’s past. At T-0, the holddown bolts released and the three launch pad umbilical arms swung back as the 1.6 million pound rocket took off, trailing three distinct engine plumes from the Aerojet Rocketdyne powerplants. Less than a minute into the flight, the center Common Booster Core’s main engine throttled back to about half-thrust as a fuel conservation effort. The 15-story starboard and port boosters continued to operate at their maximum power setting, burning out and peeling away four minutes after liftoff. The core then revved back up and burned for another 90 seconds before jettisoning to leave the upper stage’s Aerojet Rocketdyne RL10B-2 engine to continue powering into orbit on 24,750 pounds of thrust. Now out of the Earth’s atmosphere, the 17-foot-wide, 65-foot-long protective nose cone shrouding the payload was no longer needed and jettisoned about six minutes after liftoff. That’s when the ascent went into the customary, pre-arranged news blackout for NRO launches. Delta 4-Heavy shed half of its liftoff weight in less than three minutes and an astounding 90 percent within six minutes of flight. 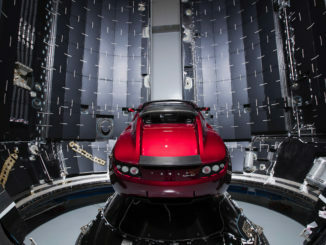 The initial burn by the upper stage put the vehicle into a low-altitude, 135-mile-high parking orbit before climbing into a highly-elliptical geosynchronous transfer orbit stretching over 22,000 miles with the second burn. A multi-hour coast ensued to reach apogee before a third burn circularized the orbit at 22,300 miles in altitude. A successful launch outcome was achieved and then publicly announced at about 10 p.m. EDT. “We are so honored to deliver the NROL-37 payload to orbit for the National Reconnaissance Office during today’s incredible launch,” said Laura Maginnis, ULA vice president of Custom Services. A direct-insertion geosynchronous orbit launch is one of the most challenging types of missions required by national security spaceflight, heaving the covert payloads to their destinations without requiring the satellites themselves to perform large-scale orbit-raising maneuvers. The Delta 4-Heavy is capable of delivering 14,900 pounds of payload into a circular geosynchronous orbit, the most of any rocket flying today. The vehicle’s maximum operation time is eight hours. This was the fifth time an operational Delta 4-Heavy reached geosynchronous orbit, once for the Air Force and now four missions for the NRO. The new spacecraft is expected to unfurl a mesh antenna as big as a football field to scoop up electronic intelligence for the National Security Agency, Molczan said. “The satellite likely consists of sensitive radio receivers and an antenna generally believed to span up to 100 meters (328 feet),” he said. The craft likely intercept telephone calls, radio signals and missile telemetry transmissions. Observers say these satellites are the brightest ones seen in geosynchronous orbit and the NRO calls them the largest in space. Previous launches occurred by Titan 4 rockets in 1995, 1998 and 2003, and Delta 4-Heavy boosters in 2009, 2010 and 2012, all from Cape Canaveral. It was not clear if this lastest launch aimed to replace one of the older spacecraft in the series or add to the fleet, nor was it yet known what part of the world the satellite would cover. Teams from United Launch Alliance, National Reconnaissance Office, the U.S. Air Force and Aerospace Corp. have been working for over three years to make today’s ascent successful. The Air Force conducts hardware reviews and design analysis as “the first line of defense to ensure a successful launch,” said Dr. Walt Lauderdale, technical director of the EELV generation and operations division within the Air Force’s Launch Systems Enterprise Directorate at the Space and Missile Systems Center in Los Angeles. 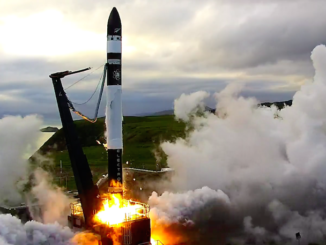 “The SMC team is dedicated to maintaining our commitment to the NRO’s mission via our thorough focus on assuring flightworthy launch vehicles,” he said. 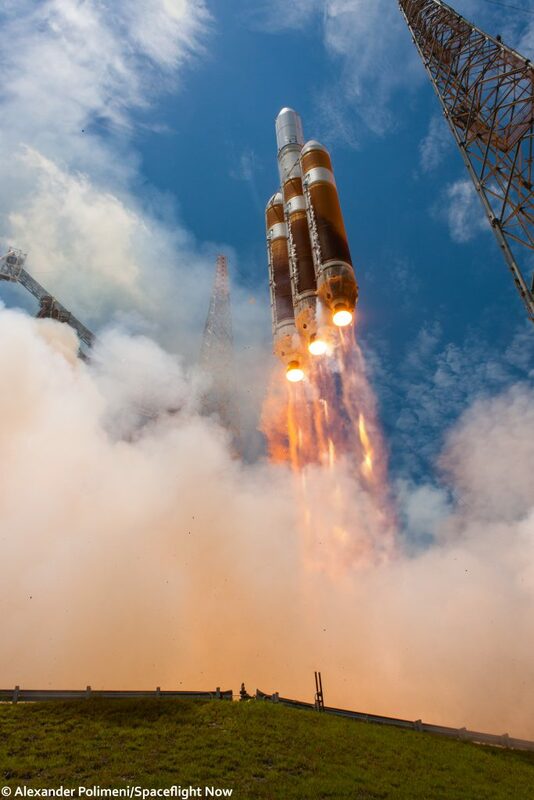 This was the 374th Delta rocket launch since 1960 and the 32nd Delta 4 since debuting in 2002. The vehicle has flown 17 Air Force flights, 10 for the National Reconnaissance Office and five commercial missions. 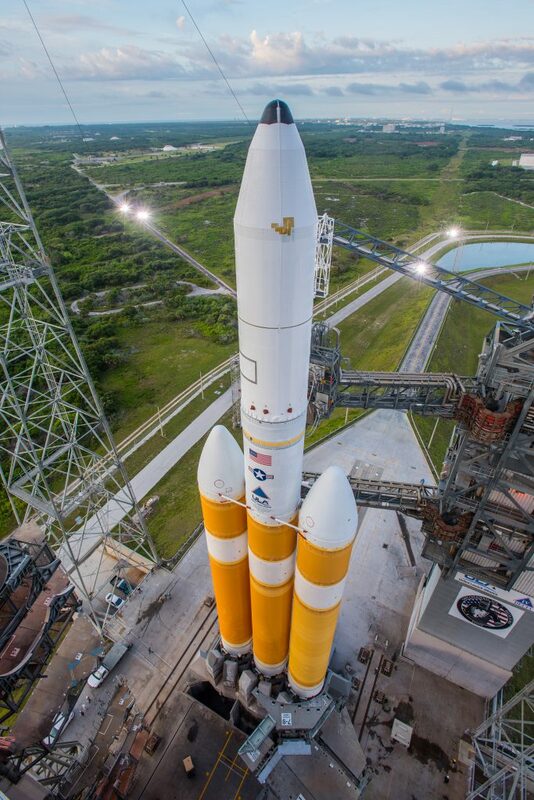 “I wouldn’t characterize any Delta 4-Heavy as ‘just another Delta.’ It is the largest operational launch vehicle currently operated by the United States,” Lauderdale said. For the NRO, is was the 44th flight since the agency began acknowledging and publicly claiming its launches in 1996 and the 21st from the Cape. 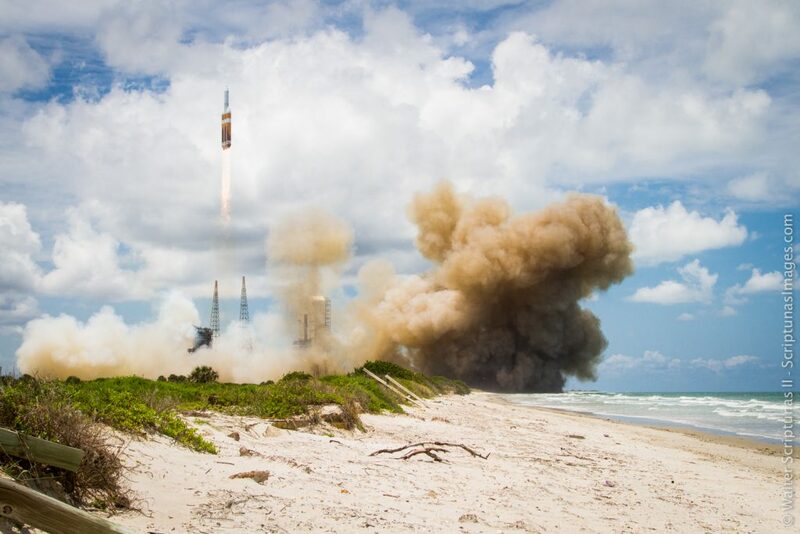 The next Delta 4 launch will put the second pair of Geosynchronous Space Situational Awareness Program, or GSSAP, inspector satellites into geosynchronous orbit for U.S. Strategic Command from the Cape in August. The next Delta 4-Heavy is planned for July 2018 to launch NASA’s Solar Probe Plus mission to fly the first spacecraft into the Sun’s atmosphere. Today also marked the 107th ULA launch since formation in 2006 and the fourth this year. Next up for ULA is an Atlas 5 to lift the Navy’s Mobile User Objective System satellite No. 5 into orbit on June 24. The company will perform another National Reconnaissance Office launch, the NROL-61 mission, at the end of July aboard an Atlas 5 from the Cape. This Heavy mission kicked off five national security space missions planned over the next four months, concluding with the launch of the WGS 8 spacecraft to expand the Defense Department’s highest-capacity communications satellite series. “And the launch vehicle team is applying the same disciplined approach to each mission to ensure that these critical assets get into place to support our intelligence and warfighter communities,” Lauderdale said.